Conversion of carbon eq. measured by FID in real VOC eq. Atmospheric emissions from canalised outputs are determined by measurements (usually done every year). 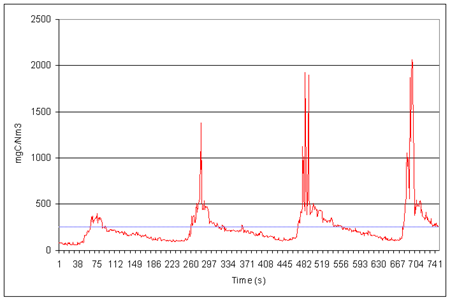 VOC concentration is often measured using FID method (Flame Ionisation Detector) which gives results in carbon equivalent (concentration in mgC/Nm3 for example). The graph shown below illustrates FID measurements on a canalised output. FID conversion tool can be used to convert FID concentration measurements to real solvent concentrations. Thus a real emissions balance can be produced for an industrial site. From theoretical calculations based on chemical's formula (case of some response factors defined in Envmodels products database). Real VOC concentration for this measurement is 263.5 mgCOV/Nm3.